Dr. Joseph D. Henry continues to serve as the Artistic Director and Conductor of the Peoria Area Civic Chorale, a position held from 1994-2011 and then again from 2014 to the present. Under his leadership the Civic Chorale has performed for thousands of Central Illinois music lovers, for professional music educators at ACDA and ILMEA conferences, and for audiences in Germany, Switzerland and Austria. Under Dr. Henry’s leadership, the Civic Chorale has also artistically collaborated with many local arts organizations including the Peoria Symphony Orchestra, Heartland Festival Orchestra, Peoria Ballet, Opera Peoria, the Central Illinois Jazz Orchestra, and the Heritage Ensemble. In 2006, Dr. Henry was presented a Lifetime Achievement Award and inducted into the Peoria Symphony Orchestra’s Hall of Fame. Following forty-one years of classroom teaching and music directing, Dr. Henry is now a Professor Emeritus at Eureka College where he served twenty-seven years as the College’s Director of Choral Activities. While at Eureka College he also served as the Associate Provost from 2011-2014. 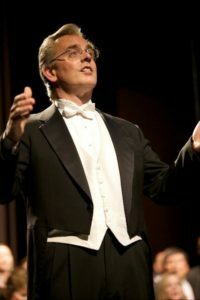 As Director of Choral Activities Dr. Henry led the College Chorale and Chamber Singers in performances for the National Association for Music Education, the American Choral Directors Association, the National-General Assembly of the Christian Churches (DOC), and on concert tours throughout the United States, Canada, Germany, Austria, and Switzerland. In 2008, Eureka College awarded Dr. Henry the Helen Cleaver Award for Excellence in Teaching. Dr. Henry has degrees in music education and conducting from the University of Southern Maine, the University of Maine, and the University of Missouri-Kansas City where he studied conducting with Gerard Chamberland, Dennis K. Cox, Larry Rachleff, Gary Hill, and Eph Ehly. He taught public school music for ten years in Maine while also serving as the All-State Festival Chairperson from 1980-1982 and then President of the Maine Music Educators Association from 1982-1984. Dr. Henry and his wife Kimberly have made their home in Eureka since 1991. They have two adult children, Kaelen Elizabeth Henry and Kelsey Louise Sandrock, and one grandchild, Bode Zachariah Sandrock. John Clark is an active keyboard musician in the Peoria area. He is currently employed in the music department at Richwoods Community High School and as organist and assistant music director at Holy Family Church. He earned a Bachelor of Arts degree from Judson College, where he majored in communications with an emphasis on public relations and radio. 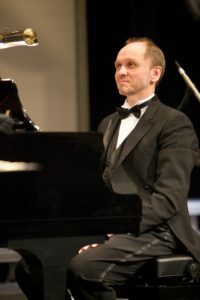 While at Judson, John also pursued the study of piano and organ and later was a graduate student in sacred music at Illinois Wesleyan University. In addition, he teaches private piano lessons and frequently performs as music director and pianist with local community theaters and the Peoria Area Civic Chorale.